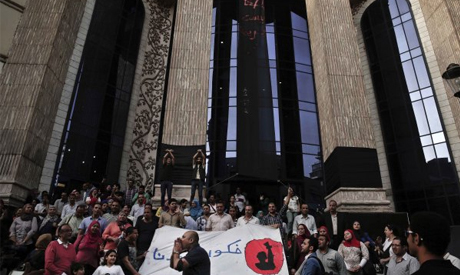 Several Egyptian political forces have criticised security forces for banning access to the Journalists Syndicate, where a sit-in by journalists is ongoing to protest a recent raid by police on the building. Security forces have for days blocked off a street leading to the downtown Cairo building after police stormed the union on Sunday to arrest two journalists, sparking public outrage. Security forces banned delegations from several political parties as well as professional syndicates who sought to enter the building to show solidarity. The lawyers syndicate said in a statement that a solidarity meeting was due to be held between a number of its board members and those of the press syndicate but was aborted by "tight security" around the building. It called for holding those responsible for such measures to account, while demanding the dismissal of the interior minister. Dozens of journalists have been staging a sit-in at the syndicate since Sunday, shortly after police stormed the union building in an unprecedented raid arresting two journalists. The move has sparked public outcry, with the union and other professional syndicates calling for the immediate sacking of the interior ministry. The interior ministry denied that it stormed the union, but said it had followed legal measures and arrested journalists Mahmoud El-Sakka and Amr Badr, accusing them of "incitement to protest" and "disrupting security and attempting to destabilise the country." They were ordered to be detained for 15 days. Farid Zahran, the head of the Egyptian Social Democratic Party, condemned what he described as "provocative" actions by police, after a number of his party's leaders were barred access to the syndicate. He said he and other party members were instead being held behind metal barriers. "I'm amazed with the level of performance of security institutions and other state institutions...There is an unusual provocation of people and abnormal alert towards journalists and media," Zahran said during TV comments to Al-Hayat TV channel. "What are these inflated fears and atmosphere of panic we’re are living in?," he wondered, saying that without wisdom shown by protesting journalists and the youth, there would have been clashes with police and victims. Rights lawyers Khaled Ali said that authorities are "assassinating the law" when upholding it "selectively" and in a manner that "serves its whims and political interests." The press syndicate is due to hold a general meeting on the crisis on Wednesday. The head of the Journalists Syndicate Yehia Qalash told a press conference on Tuesday that the regime is at war with journalists. "Instead of seeing the government take concrete measures to overcome this situation, we are surprised to see it escalating the war against journalism and journalists," he said. Egypt's top prosecutor issued a gag order in the case of the storming of the Journalists Syndicate premises on Sunday and the arrest of journalists Amr Badr and Mahmoud El-Sakka.